Outside Online puts the adventure where it should be, on the climb not on the approach. Thanks for the review Outside! Thanks GearCaster for the awesome review! Eventually we’d love to do Ice Climbing destinations like Hyalite Canyon too! Also, rakkup navigation does work with absolutely no cell coverage. Your phone only needs visible sky to see a few GPS satellites. Stay tuned for exciting features and content announcements throughout the Winter and Spring, and thanks for choosing to rakkup before you climb. Rakkup welcomes the American Alpine Club to Smith Rock for their first Craggin’ Classic. For more information on this event go to http://americanalpineclub.org/p/craggin-classic. The AAC is a great organization that unites climbers to advance the climbing way of life. Have fun at Smith this weekend! It’s SpringThing here at Smith and we’re here to volunteer with everyone. SpringThing is an important day where the climbing community pitches in to give back to the park that gives so much to climbers like us. This evening we’ll have a booth where you can preview rakkup on an iPhone or an iPad, stop by and say hi. You can also receive a coupon this weekend as thanks for volunteering at SpringThing worth 50% off our already low introductory price. Look for us in the rakkup t-shirts and ask for a coupon. We’ll also be watching Mark Hudon’s slide show tonight. Check out his awesome Yosemite pano pictures and tips here www.hudonpanos.com. It’s been a busy Spring here at rakkup. We took some extra time in January to improve this website and get it commerce-ready, and put the infrastructure in place (both here and in our iPhone application) for the new rakkup guidebook store. 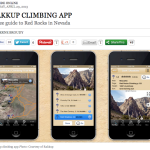 We polished and improved our iPhone app, and tested and tested at Smith Rock State Park until the navigation experience was a joy to use. Finally, we debugged and debugged until the app was solid and robust. That’s not to say we didn’t find time for some snowboarding, and even some pitches to inaugurate climbing season. Afer all, the Outdoor Geeks spirit has to stay vibrant. We’re proud of our progress though and excited to share some awesome announcements with you in May. Stay tuned to this space, or join us at Spring Thing on May 5th. That’s the volunteer event at Smith Rock where the community works together to maintain and improve the park. Hope to see you there! This week we’re camping at our secret lair, polishing our first app and getting it ready for the app store. It’s starting to feel really good and we can’t wait to get it in your hands. We got some new icon artwork from our artist, Peder, and we’re super-excited about the professional quality it lends to rakkup’s appearance. Last week we hit the road and had some very positive discussions with a couple of amazing guidebook authors who are also savvy publishers. 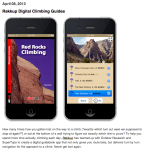 Look for rakkup data packs for some great new climbing areas in 2012, hopefully with the expertise of local climbing guides built right in. We can’t put the rope up for you or offer you a belay, but we’ll try to do everything else we can to make it just like you brought a local along for the day.